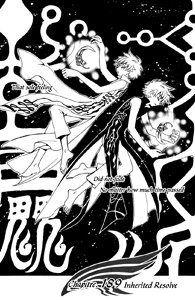 Lovely mirroring to the first chapter of xxxHOLiC. Did we ever find out why Yuuko's mirror didn't work on Watanuki? Loving the rapid TRC releases, thanks so much!!! Looking forward to the return of holic too (find it to be a much more interesting series lol). why bother.. its already been completely done by another group... why not do other series fans are dying to read but cant. dont mean to sound ungrateful cause your doing a good job. but im sure you get my point. Because bwys was the original TRC group. We want to finish the project, and everybody else's releases are of terrible quality. In my opinion, what "unknown" said is true and right. It would be a greater service to fans of manga and maybe even authors of manga if we made accessible good titles which can't be read otherwise. BWYS was more or less the sole provider of Tsubasa since the announcement of the manga until volume 14, when Hyuu~ Scans started releasing "speed" versions with c113. In the climate of 2006 this was pretty unusual and very rude for one group to start doing another group's work. It would have been outrageous to have stopped then, and it would have been copping out to our readers. In 2006, BWYS was a strong group with a big loyal base of readers (which I was one of). We knew some readers would still wait for our versions, and it was enough consolation then knowing that ours would be the versions of archive. If there was a time to drop Tsubasa, it should have been after the group got back together in 2008 after the year-long hiatus and I took over the group, around volume 16 of Tsubasa. But the readers and the members of BWYS has always been built around CLAMP and without that we might not have been able to come back as strongly as we did. Now, we're releasing volume 24 and we have up to volume 27 scanned, translated, and edited. Tsubasa is 28 volumes. QC/proofreading is the only thing holding me back from releasing it all at once. It doesn't make any sense to stop at this point. I look forward to catching up to HOLiC, without having it tied down by TRC. The new announcement that HOLiC is switching to a monthly magazine will help us match paces as well. Much of the scanning, editing, proofing staff here is interested working on lots of unpublished, unscanlated manga, but the fact is that we don't have anyone who will consistently translate non-CLAMP work. This fact would not change no matter how many things we drop. ... so if you know any one who would translate 3gatsu or other good seinens or food-related manga, please!!! We have excellent editing staff, we could whirlwind through some amazing undiscovered manga if we could just be set free of translator woes!